Looking for deals in Brussels? 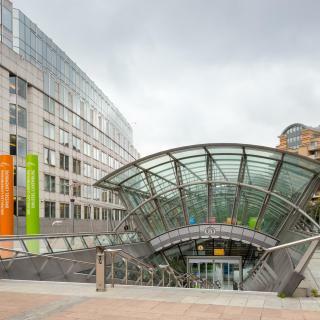 Set within 0.9 mi of European Parliament and Mont des Arts, Courtyard by Marriott Brussels EU provides rooms in Brussels. Super clean, friendly staff, and great customer service. Opening in April 2016, Hotel Agora Brussels Grand Placer is housed in a historical Brussels building dating from 1696, 722 feet from The King's House in the Grand Place. the location was great. it's only three minutes walk to the Central station and 2 minutes walk from the grand place. the staff was friendly and helpful . although the room was a little bit small it's very comfortable and clean. I highly recommend this place. The Motel One Brussels is centrally in Brussels, a 10-minute walk from the Grand-Place, the Manneken Pis Statue, the Rue Neuve Shopping District and Brussels-Central Train Station. Perfect location, perfect price, perfect staff attitudes, everything was excellent! Dansaert Hotel is located in Brussels, at the heart of a chic neighborhood 1312 feet from Grand Place Brussels and Brussels City Hall. There is a 24-hour front desk at the property. From the moment I walked in the door - the service was amazing. Located in the lively area of Louisa, Hotel ibis Styles Brussels Center Stéphanie offers design accommodations with flat-screen TV and free WiFi 1476 feet from the Stéphanie Square. This is a nice hotel in the heart of Brussels' shopping district. 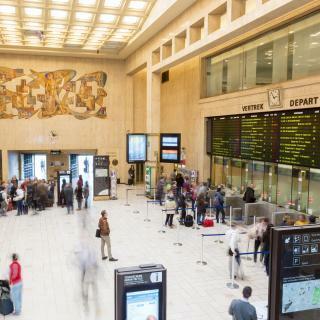 Set on Victor Horta Square directly in Gare du Midi, Pullman Brussels Center Midi features rooms with two free bottles of water and a Chromecast technology IPTV. 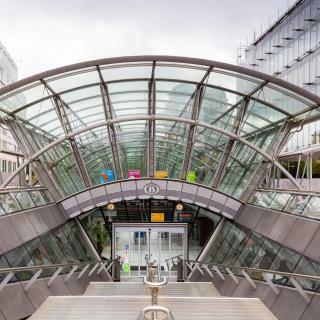 Perfectly located in Brussels Midi (Zuid) train station with direct service to Brussels Airport. Hygge Hotel is located in Brussels and features a garden. Featuring a terrace, this property is located a short distance from Egmont Palace, Magritte Museum and Film Museum. This hotel's design and location are outstanding. It feels like home. EasyHotel Brussels City Center offers accommodations in Brussels. Some units include views of the garden or city. All rooms include a private bathroom fitted with a shower. Location, clean and comfortable room, friendly staff. Offering free WiFi, Hôtel Méribel offers rooms in Brussels, a 13-minute walk from Belgian Comic Strip Center. The property is close to Rue Neuve, Mont des Arts and Place Royale. The room was super clean, the owners were very friendly and helpful about everything. Train Hostel brings a unique and fun concept in a strategic location in Brussels. Guests can enjoy the unique experience in a room with a railway theme. Very comfortable, the staff was the best ! On the banks of the Charleroi-Brussels canal in an old factory,designer hotel Meininger offers free Wi-Fi and a 24-hour front desk. The Grand Place is one mile away. This hotel has wide corridors and big rooms. We had a room for three, and it was excellent. Historic Art Deco style, modern facilities such as free WiFi and a convenient city center location combine at Le Berger. This hotel includes a Italian cuisine restaurant and a bar. This hotel is a fun place to stay because of its unique history. This colorful boutique hotel offers quiet rooms with air-conditioning and free Wi-Fi hotspot in the trendy Saint Gilles quarter of Brussels. Excellent hotel, friendly, very comfortable room, quiet and very well located nearby the centre! Located 984 feet from the Avenue Louise in Brussels, Hotel Residence 18 offers a garden. Free WiFi access is available. The European District is 0.9 mi away. They upgraded me to the largest room (8) and were incredibly nice throughout. Located in Brussels, within a 7-minute walk of Avenue Louise and 0.7 miles of Horta Museum, Résidence18 provides accommodations with a garden and free WiFi. The room was clean, airy and chic design. How much does it cost to stay in a hotel in Brussels? On average, 3-star hotels in Brussels cost $106 per night, and 4-star hotels in Brussels are $146 per night. If you're looking for something really special, a 5-star hotel in Brussels can be found for $473 per night, on average (based on Booking.com prices). Which hotels in Brussels offer an especially good breakfast? For hotels in Brussels that serve highly-rated breakfasts, try Hotel Agora Brussels Grand Place, Hotel Made In Louise, and Thon Hotel EU. Which hotels are the best ones to stay at in Brussels? FunKey Hotel, Hotel Made In Louise, and Rocco Forte Hotel Amigo are some of the popular hotels in Brussels. Which hotels in Brussels are good for couples? These hotels in Brussels are highly rated by couples: Hotel Made In Louise, Harmon House, and Hotel Residence 18. Which hotels in Brussels are good for families? Many families visiting Brussels loved staying at FunKey Hotel, Hotel Residence 18, and Hotel Made In Louise. Which neighborhood is the best one to stay at in Brussels? Anderlecht, Oudergem / Auderghem, and Sint-Agatha-Berchem are popular with other travelers visiting Brussels. How much is a hotel in Brussels for this weekend? The average price per night for a 3-star hotel in Brussels this weekend is $216 or, for a 4-star hotel, $250. Looking for something even fancier? 5-star hotels in Brussels for this weekend cost around $357 per night, on average (based on Booking.com prices). What are the best hotels in Brussels near Grand Place? Some of the best hotels in Brussels near Grand Place include Art de Sejour - B&B, Grand Place The Looks Apartment and Apartment XYZ Brussels. How much is a hotel in Brussels for tonight? On average, it costs $119 per night to book a 3-star hotel in Brussels for tonight. You'll pay around $178 if you choose to stay in a 4-star hotel tonight, while a 5-star hotel in Brussels will cost around $234, on average (based on Booking.com prices). Which hotels in Brussels have nice views? The Hotel Brussels, Hotel Agora Brussels Grand Place, and Hotel Residence 18 got great room view-related reviews from travelers in Brussels. 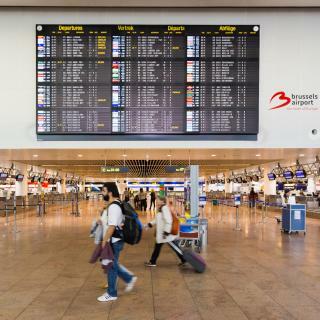 What are the best hotels in Brussels near Zaventem Airport? 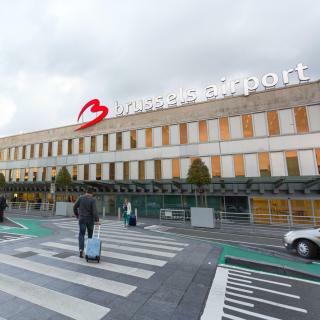 Travelers who stayed in Brussels near Zaventem Airport (BRU) have said good things about Sheraton Brussels Airport Hotel, Novotel Brussels Airport, and Crowne Plaza Brussels Airport. Brussels is well-known as the headquarters of many European institutions and is often called the capital of Europe. However, Belgian waffles, beer and chocolate are just a few of the city’s best-known delicacies that can rival its political reputation. French and Dutch are the city’s two official languages, so all streets and landmarks have two different names: don’t be surprised when you look for Grand Place and end up at Grote Markt! Don’t miss the famous bronze, aptly named Manneken Pis statue or the futuristic Atomium, a truly unique architectural creation. Wandering through side streets to discover small bookshops, romantic cafés and ethnic restaurants reveals Brussels's charm. 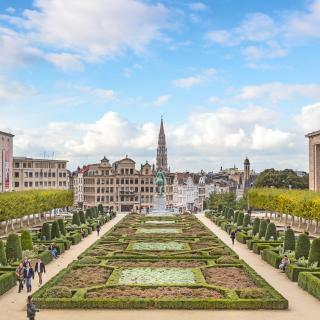 Brussels is a real melting pot of Europe, filled with great museums and art from Memling, Bosch or Rubens, historic breweries and great concert halls. Shopping addicts can visit the world’s first shopping mall, the Saint Hubert Gallery, opened here in 1847. If you’re arriving at Brussels Airport or South Charleroi Airport, all major attractions are just a short train or bus ride away. Whether you’re looking for a design hotel, a comfortable apartment or a friendly B&B, Booking.com has something perfect for your trip to Brussels. Brussels exceeded all my expectations. Brussels exceeded all my expectations. I liked it more than so much advertised Amsterdam. There is much more interesting architecture. Streets and public places are much cleaner and well organized. 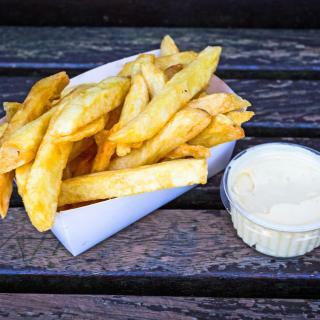 The food it superior to Amsterdam, Hague and Luxembourg. The guides in Brussels appear to be more knowledgeable than in other places in BeNeLux (except, may be, for Antwerp). Access to places around is very convenient and vehicle can be easily used unlike in Amsterdam. The only two features I did not like in Brussels: throngs of Euro bureaucrats everywhere, most of them naughty and rude, and a lot of construction cranes spoiling the old city view. It was beautiful, friendly and fun. It was beautiful, friendly and fun. Definitely eat from the small street food vendors, get the flights of beer and ask for local recommendations. Other than the bars, businesses close early so make sure you've eaten by 7pm. We stayed at 2 different locations at each end of our trip and the Ibis City Center was definitely our favorite. Just a few steps from the Grand Place and a couple more blocks to the Mannikin Pis. Easy to take day trips but they were very long. Easy to take day trips but they were very long. For instance, Amsterdam was 13 hours with a LOT of walking. After checking the opening times on the web for the Royal Palace, when we arrived, we found it was only open in summer, which was very aggravating. Subways and trains were good. Museums not great. We were sick in bed for half our stay so it didnt matter that we were there too long. However, being laid up prevented us from ever sampling a Belgian waffle or chocolate! Brussels is so beautiful, the architecture was stunning. Brussels is so beautiful, the architecture was stunning. Really what comes to mind when you invision a classic European city. Every other shop sells chocolates or waffles, And the streets smell amazing. I'd recommend the plain leige waffle. It's so sweet by itself you don't need it piled with stuff. I took a chocolate making class, waffle workshop and saw the French Opera. Tip: you can get discount tickets if you're under 30. I think they are trying to keep the next generation interested in the arts. Note: usually its not in English. Brussels seems to be quite a dull city now. Brussels seems to be quite a dull city now. Outside the relatively small area of the Old Town the city looks virtually dead after 7 pm. It seemed not to be like this some 30 years ago. Could it be the influence of bureaucracy? Wonderful galleries if you’re a fan of Dutch painting, great historic square and architecture. On major train line from Paris/London; be sure to go up to Bruges for sightseeing, moules and pommes frites . Good hotel, great location, 10 mins walking to city center, 3 mins to rue neuve (main shopping street), facing mahaten center and new starbucks, and city mall, many restaurants are around, best lunch at steak house restaurant facing the hotel, easy access to public transportation via rogie metro station, good breakfast, same entrance and lobby and restaurant with hotel des colonnies and progress hotel, quiet area at night, as summary it s good place to stay in brussels. Location of the hotel is great. is right in a street with shops and right at the corner there are bus and metro stops to get u to center in less than 10mins. It was very clean and comfortable. .but a little dark..and also the elevator and stairs are very small Communication with the hotel was great they even manage to text me before my arrival to make sure everything is arranged. I booked it for 3 days so i believe its price was very good considering its brussels. Everything was reveal nice in this place. Spacious and cozy apartment, comfortable bar, nice bathroom. There’s a good restaurant on the first floor. The personal who works there is very friendly, polite and helpful. The hotel is situated on one of the biggest avenues of Brussels, pretty close to the city center, there’s a lot of different shops, cafes, bars, parks around. I’m really satisfied with my staying here, thanks to i everyone who made it nice! Happening place, there’s a nice bar and chill out space and it’s convenient and great when you just want to chill in the hotel. Beer tour was short but highly recommend it for starters on your beer hunt in Brussels! Friendly and helpful staffs. Not too far from be grand place area (about 20mins walk - hey! Best to explore Brussels by foot!). Great experience all in all! The lobby is grand and nice and there is a terrace with a little garden for guests to relax or take breakfasts outside. Room is a little small but comfortable, clean and well equipped. It's located 5mins by walking from the grand place. All in all, perfect hotel for a short stay in Brussels. Great location. Close to the city Centre and close to the Brussels North train station (approx 30 min train ride to airport). No need to catch a subway. Staff were fantastic and super friendly. The facilities at the hotel are marvelous. Would definitely visit again. This is a lovely boutique hotel within walking distance of Brussels Midi station. The staff were the best I have encountered in a long time. Attentive, helpful and just so friendly. The beds are so comfortable and the whole hotel has a lovely clean feeling about it. Everything was excellent. One of the best hotels in Brussels! Very nice and clean, very close to the city center and great hospitality.The staffs were very kind and helpful. Overall, it was an awesome experience and definitely worth it to come back. It’s such a beautiful boutique hotel with so much historic glamour and being in such a great central location that’s close to royal palace, central station and the grand place which made our stay in Brussels very enjoyable. Will come back for sure! Best hotel experience in Brussels: Extraordinary concept (“game theme“ in whole hotel), perfect location (close to city centre), tasty breakfast, parking opportunities, spacious room and everything clean and comfortable. Top! The hotel is perfectly located in walking distance to both Brussels-Midi and the city center. Despite it is an old hotel with basic comfort I found it a perfect match for the cost we paid (74 eur per night). Nice location near central Brussels and easy walking distance to most historic sights. Located just off Avenue Louise and only a 15 to 20 minute walk to city center/Grand place. Great Hotel. The staff is always kind and helpful. Location is near Grand Place, Maneken Pis, Central Station and also subway. Breakfast is rich and rooms are clean. Beautiful spa and clean, comfortable room!